Ahh!!!!! It’s summer. The pastoral orchards call. The greening vineyards beckon. The Colorado River roars its power and lure. Each day is a perfect getaway to roam the Valley, over hills and vale, through streets and trails, not on a bus or train, not in a car or on a plane. 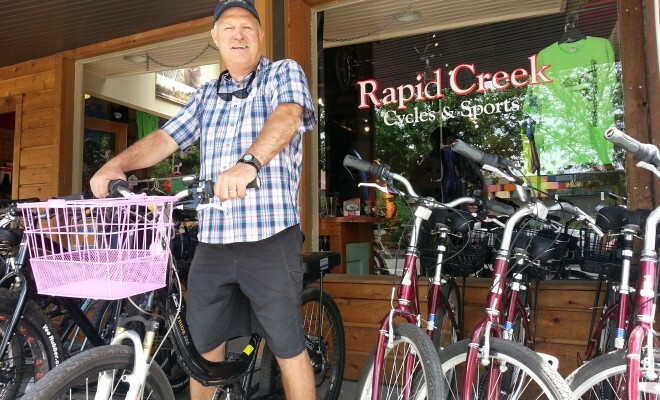 According to local businessman Rondo Buecheler, he believes the best way to enjoy all Palisade offers is on a bicycle, rented or sold from Rapid Creek Cycles. Bicycling is not the only business that Buecheler promotes on Main Street, every day, all the time, from March to December, but bikes are his best-sellers. The newest option at Rapid Creek Cycles is an electric bicycle. “We rent electric tour bikes, mountain bikes, road bikes, and comfort cruiser bikes. We have every bike you can imagine,” Buecheler said as he listed his business inventory for this summer. Did he say, “electric bike”? “We are the only people in the Valley that I know selling and renting the Electric bike. They start at around $1400 and rent for $60 a day,” he said. Buecheler and his business partner Scott Winans have a plethora of other bikes to rent or sell at their store. Most people perfer to rent the “comfy cruisers” because they are familiar, traditional style, easy to ride, and have a basket to hold wine, peaches or Palisade products that they pick up on the bike ride. They are the staple of his six-year-old business in Palisade. “We probably rent 40 to 60 bikes a weekend,” Buecheler admits, but Rapid Creek Cycles has more to offer locals and visitors. Bikes are not the only items in this growing business. Inside his bike business Buecheler also offers rafting, and boating. He rents paddle boards –” ‘solid 10’ molded plastic boards used for riding the waves in De Beque Canyon,” to anyone interested in that river activity. Since he is a qualified river guide, he schedules and leads river trips in his dorie, a flat-bottom boat built to buffet the waves in taking passengers down the Colorado River for a cocktail cruise. Guests enjoy all the outdoor activities that he can offer before he recommends the local Palisade dining, wining and entertainment spots where visitors enjoy a nice dinner, brewery and winery or orchard tour. Because he has been in Palisade for six years “developing and marketing the whole biking and boating business,” Buecheler’s business is growing in so many ways; he has so many endeavors besides the bicycles. “I try to promote all of Palisade, especially on the weekdays,” he said. “Thursday will get a little busier. Friday is getting busy for the weekend, and Mondays are busy, but Tuesday, Wednesday and Thursday are the slowest days. “Weekdays are the best time for locals or anyone to come to Palisade,” he points out. All the businesses are open, fewer people, and still the best scenery and activities of the Valley, especially the east end. Next Story → We Appreciate Keli Frasier!